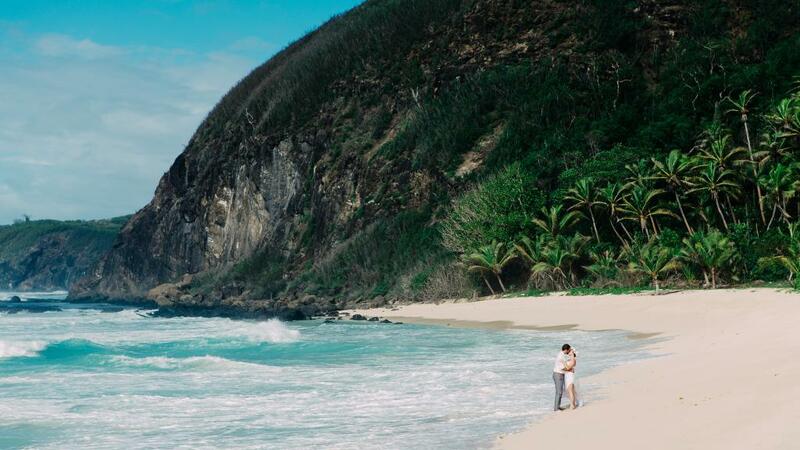 With its picture perfect landscape and famously hospitable culture, it's no surprise that Samoa has become a world renowned wedding destination. Located just 5 hours from Sydney, Samoa is easily accessible and perfect for couples expecting a large group of wedding guests. Couples can tie the knot beneath a romantic tropical paradise surrounded by azure blue waters, palm-fringed coconut trees and islands blanketed by emerald green forests. According to Fa'a Samoa (the Samoan way) marriage is a beautiful and sacred union to be respected and honoured. Traditionally, Samoan weddings are a magnificent and grand celebration where the bride wears a pale (head-dress) and the groom dons an ulu (floral necklace). Brides are also escorted down the isle by a group of Samoan warriors and serenaded with traditional music and beating drums. While these cultural traditions aren't mandatory for your own wedding, they are all available for a unique touch. Despite what you may think, getting married in Samoa is easy and hassle free. Best of all marriages in Samoa are legally binding and recognised all over the world. To marry in Samoa, couples are required to fill out an application for a marriage license at least 10 days prior (but no more than 3 months in advance) to your wedding day. This application must be complete by the Ministry of Justice in Apia either in person, via fax or email. You will also need to be in Samoa a few days prior to your wedding. Sheraton Samoa Aggie Grey's Hotel & Bungalow: Renowned as Samoa's most famous address, the Aggie Grey Hotel has been dazzling visitors for decades. The hotel features a range of fantastic wedding packages including a wedding celebrant and your own personal wedding coordinator, hairdresser for the bride, tropical flowers and traditional Samoan entrance. The venue also features a fully restored 100 year old chapel made from burnt coral. Seabreeze Resort: A delightful way to say "I do" beside the peaceful lagoon, this Samoan resort is a spectacular location for a wedding. The Seabreeze resort offers a romantic wedding package that includes a beachfront ceremony, local warriors dressed in traditional costume, local string band and a registered minister. Optional extras include a photographer, videographer, and live entertainment. Sheraton Samoa Beach Resort: Offering beautiful ceremony options from beachfront romance to lush tropical gardens, the Sheraton Samoa Beach Resort is an amazing wedding location. Providing couples the choice between 3 distinct wedding venues, marriage celebrant, string band, PA system and so much more, the Sheraton also caters for up to 30 wedding guests.